Maximus allows users to add and view Gemini Email Audiences, targeting segments that use a CSV list of email addresses to target specific users. The audiences for these targeting segments are based on the email addresses you provide and are available for specific sub accounts you choose to add them to. Your campaigns will only be seen by those users who have logged in under that email address when viewing ads. A new audience can be created by going to the settings tab and selecting 'Add Gemini Email Audiences' on the left hand side. Email lists can only be in a .CSV file format. Each email must be on a separate line, with no empty lines or extra spaces at the end or beginning of the emails in the CSV. Up to 100,000 emails may be used for each CSV. After the CSV is uploaded the emails are encrypted to protect your lists. Name: The name for your new audience. Description: A short description of your new audience. Gemini Sub Account: The Gemini account that the audience will be added to. You can add to multiple sub accounts using the dropdown menu. The sub account name will be appended to the audience name for each sub account. Upload CSV File: List of emails of the users to target. It may take up to 24 hours for the audience to display within Gemini. 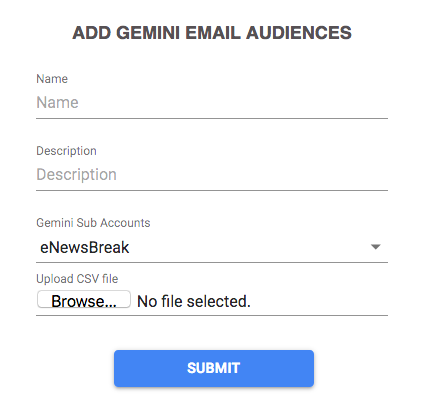 To view all audiences created, click 'View Gemini Email Audiences' from the side menu on the Settings page. To update the email list for an audience, click 'Update' to upload a new email list. 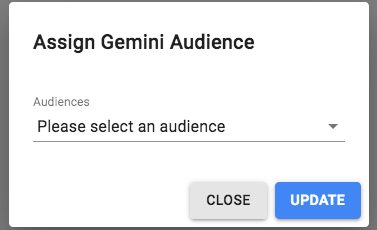 Audiences can be added to a Gemini campaigns by clicking the 'Assign Gemini Audience' link on the side menu when view the Campaign Details for that campaign. This will display a pop to select the audience to assign to the campaign. To remove audiences, follow the same steps to add an audience. Select the X next to the audience name to remove it from your campaign, and then click Update. You can remove multiple audiences at the same time if you have more than one you would like to remove from your campaign.